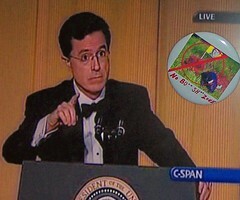 Patriotic People CARE: Stephen Colbert lives in the no bu**sh** zone! He wins by NO BU**SH** award! thank you for your funny, brilliant and thought provoking humor! http://video.google.com/videoplay?docid=-869183917758574879&pr=goog-sl video LINK! Don't you wish you could make 'them' watch it til they GET it? Whose 'them'? Hmmm,Maybe the mainstream media folks who are so intimidated, some of the generals and politicians, who might have to see it a few more times before it sinks in, and Laura Bush maybe. Forget about George- he never will. I'm almost as excited about this, as George is about that fish he was bu**sh**ing about.